On November 02, 2104,Sunday,at 02:05:45 am, Saturn moves from Libra into Scorpio.He remains in Scorpio, till October 25,2017, Wednesday,03:37:53 pm.That is for a full 3 years. Now, our interest is how could this period be for the markets? Iam sure we are interested to know, at least how it will be for the coming quarter, right? I just went back to see how our market performed during the last sojourn of Saturn in Scorpio. Our Nifty was not even born then and so I had looked up at Sensex. Since Saturn takes 30 years to complete the zodiac of 12 signs, the last time he was in Scorpio, was in 1984 December, till 1987 December. Saturn in Scorpio, was very positive! He took the market from 250 odd levels,( 250, my goodness! Sensex which is at 26,787, was such a small baby then!) to 650+ and brought it down to 400+, by the time he left Scorpio. Of course Saturn alone was not responsible for this, but he is an important member of the larger council of planets who very definitely have a say in the way the world is influenced. So we may expect Saturnian influence to prevail. So what observations can we make? 1. Saturn in Scorpio is definitely positive for equity markets especially in the initial stages. 2. His initial retro period is not a problem. 3. But when other major planets also get involved in creating an energy vortex by their positions and by their aspects to one another, then things could get ugly. 4. When Saturn becomes stationary direct, then the trend resumes once again. 5. If the longer retrograde period of Saturn coincides with other long term planetary aspects, then major trend changes happen in the markets. Apart from a Mars Pluto conjunction, a Pluto Uranus square triggered by a Venus Uranus square,there is not enough powder keg to ignite the markets downwards.Mars Pluto conjunction is no joke, but it may not provoke a prolonged decline yet. On December 08, 2014, Jupiter turns retrograde.First sign of trouble. Throughout the month, Venus, Mercury and Sun trigger the Pluto Uranus axis and cause issues regarding debt, deflation and transformation to be brought to the fore front. On January 15, 2015, we see bigger planets getting into the act. 1.Pluto Uranus axis is triggered by Ketu and Rahu,which is Uranus conjunct Ketu opposing Rahu and square Pluto. 2. On 16th Jan Mars will square Saturn. With Jupiter also retrograde, the scenario is fast deteriorating. To conclude, Saturn in Scorpio ought to be positive, at least in the initial stages. When major planets get involved in January 2015, uptrend could die rapidly. So it appears that the markets could go up till January 2015 by which time, large planets get into action and a trend change could happen. By August 03, 2015, Saturn becomes stationary direct once again and that could start a final upleg, which could take the markets into 2016. 1992-2000-2008- 2016--this sequence could get activated then! This is just an empirical understanding. Let us use this information along with other technical tools to get better conviction. This is what I had been writing in this space since the last two months. Please do not take the past performance too literally.Remember the planetary positions in 1984 and in 2014 are very different.My take will be only so much. 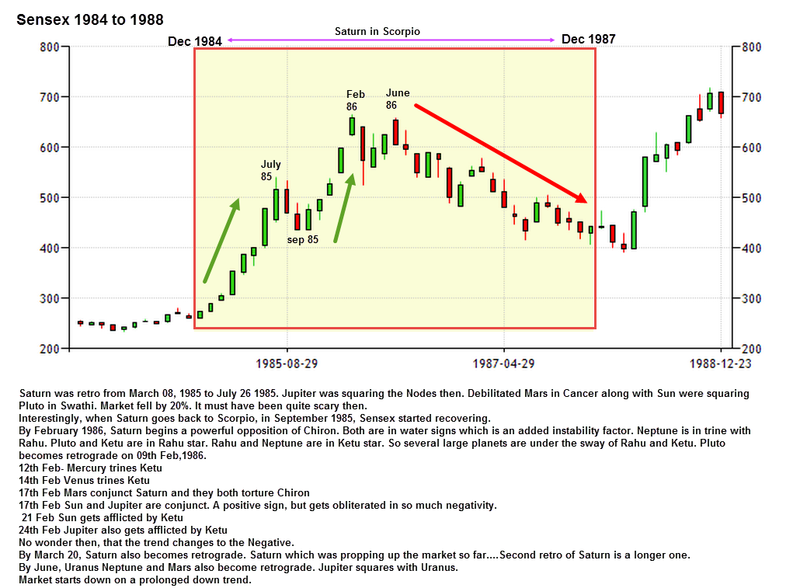 1.Saturn in Scorpio is not necessarily bearish.Especially the first few months could be bullish even. 2.Large planetary aspects in Jan 2015 point to a larger correction. Let us not read anything beyond that.The way to use such information is to look for technical confirmation before making a market decision. Also in this visit of Saturn the three year Uranus Pluto square formation will come to an end.Last formation is in March 2015.That dynamic has to be separately examined. Regarding sectoral inputs I am working on it.It is far more complex than a composite market analysis.Nevertheless I shall share my findings once I get better understanding. Major difference between 1984-87, Saturn in Scorpio scenario is that Jupiter was ahead of Saturn (Sagittarus to Pisces in same time frame), whereas this time around Saturn comes under aspect of an exalted Jupiter in Scorpio till May-June 2015 . Jupiter remains behind Saturn till it conjuncts it in 2019-20 time frame. Thank you for the value add. Saturn will be in 9/5 position with Jupiter, but actually does not form an aspect. So the true dynamics of a Saturn Jupiter trine may not manifest. Before Jpiter could form a trine with Saturn, Jupiter becomes retrograde.In August 2015, when Jupiter moves to Leo, then he forms an exact 90 degree aspect with Saturn..